U.S. Air Force B-1B Lancers assigned to the 9th Expeditionary Bomb Squadron, deployed from Dyess Air Force Base, Texas, fly with South Korean F-15 fighter jets over the Korean Peninsula, Friday, July 7, 2017. 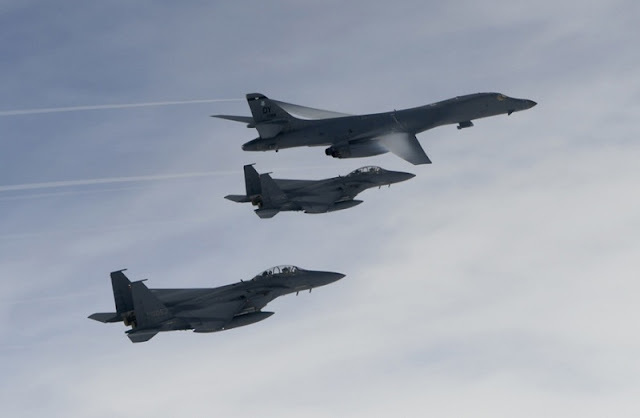 WASHINGTON - U.S. Air Force B-1B Lancer bombers escorted by fighter jets flew in international airspace over waters east of North Korea on Saturday in a show of force the Pentagon said demonstrated the range of military options available to President Donald Trump. “This is the farthest north of the Demilitarized Zone (DMZ) any U.S. fighter or bomber aircraft have flown off North Korea’s coast in the 21st century, underscoring the seriousness with which we take (North Korea‘s) reckless behavior,” said Pentagon spokeswoman Dana White. U.S. Air Force B-1B Lancer bombers escorted by fighter jets flew in international airspace over waters east of North Korea on Saturday in a show of force the Pentagon said demonstrated the range of military options available to President Donald Trump.